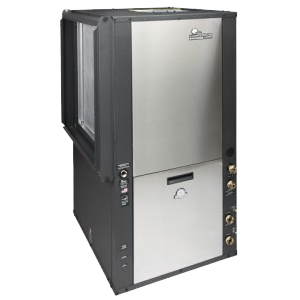 The Tranquility 30 Digital Series is one of the most advanced, efficient, comfortable and environmentally friendly methods of heating and cooling available to homeowners. Its advanced design includes two-stage compressor operation, variable-speed indoor fan, vFlow variable water flow technology and iGate communicating controls. vFlow internal variable water flow technology reduces water pumping power consumed by 60-80% compared to traditional external pumping modules, which can save over $100 per year in an average 2,000 square foot home. iGate communicating controls constantly monitor and control system operation for increased reliability and longer system life. Consistent geothermal (below ground) temperature reduces system energy use. vFlow technology reduces water pumping power consumed by 60-80% compared to traditional external pumping modules. Two-stage technology automatically adjusts itself to provide consistent indoor air temperatures regardless of outdoor weather extremes. Insulated compressor compartment and interior cabinet reduces system noise, plus no noisy outdoor fans are used. Cabinets are heavy-gauge galvanized steel and epoxy powder coated for a durable, long-lasting finish. The stainless steel drain pan is corrosion and stain resistant. High-efficiency filter system provides superior indoor air quality.